The 2,466-square-foot house ranch-style house at 570 Morehouse Road and its 5.5-acre level property combine to create a restorative place that allows for an easy lifestyle. 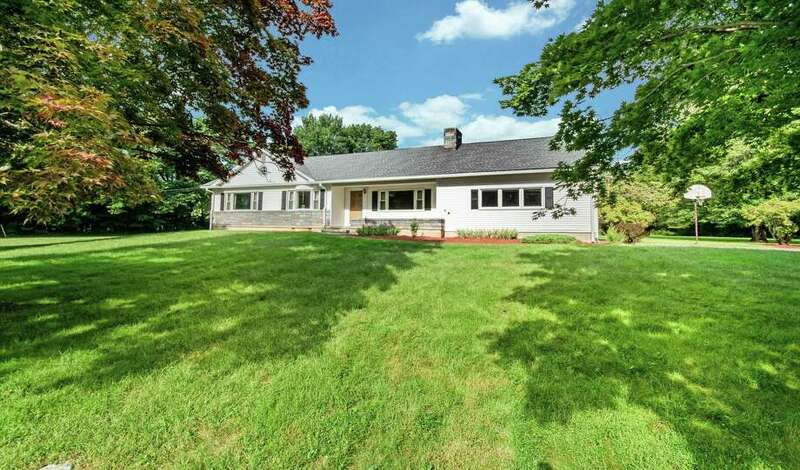 EASTON — The modest ranch-style house at 570 Morehouse Road and its sizable surrounding acreage combine to create a restorative place that allows for an easy lifestyle, whether every night after work or every weekend. This retreat from the world features 5.5 acres of possibilities. The large level property in the center of Easton has an in-ground swimming pool and a wood deck in the backyard. The sprawling front lawn is an ideal platform for lawn games like croquet, badminton and bocce. The sprawling backyard is an ideal platform for soccer games, volleyball and picnics. And there is plenty of room left for vegetable and flower gardens. If the next owners have young children, this house is ideal because of its location. It is within walking distance of the local elementary school. The public library and town hall are also close by on Morehouse Road; and for commuters, this house is just minutes from the Merritt Parkway and Route 136 to Fairfield, Westport and Weston. Other local amenities that are nearby include a community recreation center, basketball court, golf course, park, playground/tot lot, stables and riding facilities, farms and tennis courts. A long driveway leads to the parking area that allows for a number of vehicles for those picnics and other family gatherings. From there a concrete pathway leads to the covered front entrance, first passing by the long quarried granite flower box. Inside there were many updates and improvements made to this 2,466-square-foot house, which was first built in 1955, including the bathrooms and finished lower level. There is an easy flowing floor plan, three good-sized bedrooms, hardwood flooring throughout most of the house, and a large eat-in kitchen with an adjoining family room. The formal living room features a quarried granite stone fireplace flanked by built-in display shelves and cabinets, and a large picture window. In the formal dining room there is a bow window. Both of these formal rooms and the more casual family room have crown molding. In the sizable kitchen there is a breakfast nook, ceiling fan, Corian counters, a tile floor, and a stainless sink. In the family room there is a ceiling fan, a picture window looking over the backyard, and a door to the deck and pool. This area of the house also has a half bath with tiles on the lower walls that resemble marble, and access to the attached two-car garage. In the opposite wing there are three bedrooms. The master bedroom has a large picture window and a spacious bath. On the full, partially finished lower level there is a long room that can be divided into two or three separate areas — a media room, a sitting or reading area, and a game or recreation space. One of the areas contains a red brick fireplace. An unfinished area on this level is used as an exercise room. There is also a laundry area and plenty of storage. At the back of the property there is a barn with a workshop. For more information or to set up an appointment to see the house, contact Alison Sternberg of Halstead Real Estate at 203-414- 8693 or asternberg@halstead.com.